A rare World War Two aircraft cockpit which was found in a scrap yard has been restored. All 3,300 Hawker Typhoons or "Tiffies" were built at the Gloster Aircraft Company's Hucclecote factory but now only one complete example exists. The cockpit was found in Chippenham in 1996 and it is now ready for display at the Jet Age museum. 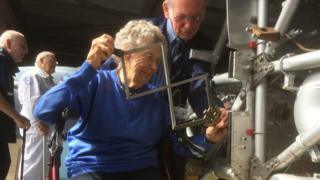 Peggy Fisher, 96, worked on Typhoons in the 1940s, and fitted the final rivet to the cockpit's bulkhead earlier. The farmer's daughter said she had been expected to go and work with the land army. "But I didn't want to do that," she said. "I borrowed my dad's car, drove to GAC, and got a job. Image caption Apprentices from local engineering companies helped volunteers at the Jet Age Museum restore the cockpit. "Looking back I felt very privileged but in those days the war was on - and we weren't doing well. "I really felt I was helping to do something for the war." Some 7,000 hours of work went into restoring the cockpit for display at the Gloucestershire museum.